Manage all of your AoPS mailing lists here. Schedule a free consultation and assessment of your child's readiness for AoPS Academy. Need more information about an AoPS Academy course? A variety of contests are available to AoPS Academy students. This class focuses on strengthening and deepening students’ language arts skills as they prepare for high-school level academic writing. The class will be structured around three multi-week writing projects: a position paper, an analysis essay, and a research paper. At the end of the year, students will revise their work and compile a portfolio. The arc of these projects will help students develop skills in evaluating sources, argumentation, critical thinking, research, and effective rhetoric. Additionally, students will review foundational grammar concepts in greater depth and learn new vocabulary words. The goal of our grammar and vocabulary lessons is to improve students’ writing mechanics for implementation in their multi-week writing projects. Complete a warm-up writing prompt that sets the stage for concepts introduced in the lessons. Learn and practice a writing skill relevant to their ongoing writing project. Review and practice grammar concepts using their grammar workbook. Learn and review vocabulary, including Greek and Latin roots. Students should expect to spend 60-90 minutes on homework each week. Throughout the year, students will work on several multi-week writing projects. Most weeks, they will complete part of a project at home. It is crucial that students keep up with this homework and come prepared for class each week. Students will also have a weekly reading in their grammar text to review: doing this reading at home frees up class time for practicing and receiving feedback. While it will not be officially assigned, students should also plan to review their vocabulary words between classes using their vocabulary textbook. Students will be assigned several vocabulary practice problems each week, which they will complete through the course homepage. Finally, students will be expected to read independently throughout the year, selecting books from the Recommended Reading List for Grades 8 and Above. Since students will complete most of their writing in class, there will be many opportunities for the teacher to provide informal feedback face-to-face while students are working. The teacher will conference with students regularly during class, providing oral feedback and some informal written notes on their work. At the end of each multi-week project, students will submit their final draft and receive detailed, formal written feedback from their teacher. At the end of the year, students will revise their work on three of these projects and compile a writing portfolio. Students will take an exam at the end of each quarter during class, weeks: 9, 18, 27, and 36. Each exam will assess students on the grammar and vocabulary covered that quarter. "Our homeschooled son is extremely gifted in math and science. He really feels at home at AoPS Academy. Through coaching and personal attention at AoPS, he achieved a 5 in AP Calculus at 11 years old and a 4 in AP Statistics at 12. He also achieved an 800 on SAT II math at 12 years old. Our son feels very comfortable in the atmosphere of AoPS, where being gifted in math is not looked down on, but treated with respect. He has truly found his peers at AoPS Academy. 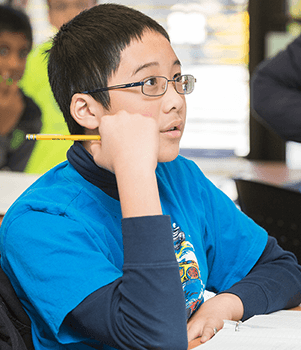 AoPS Academy allows my son to be himself, learn that there are other kids well advanced in math, and gives him the confidence to know that it is OK to be great in math, and that other people will respect and value his ability."